Nobody likes the occasional irritated throat or raspy voice while you get through your day. 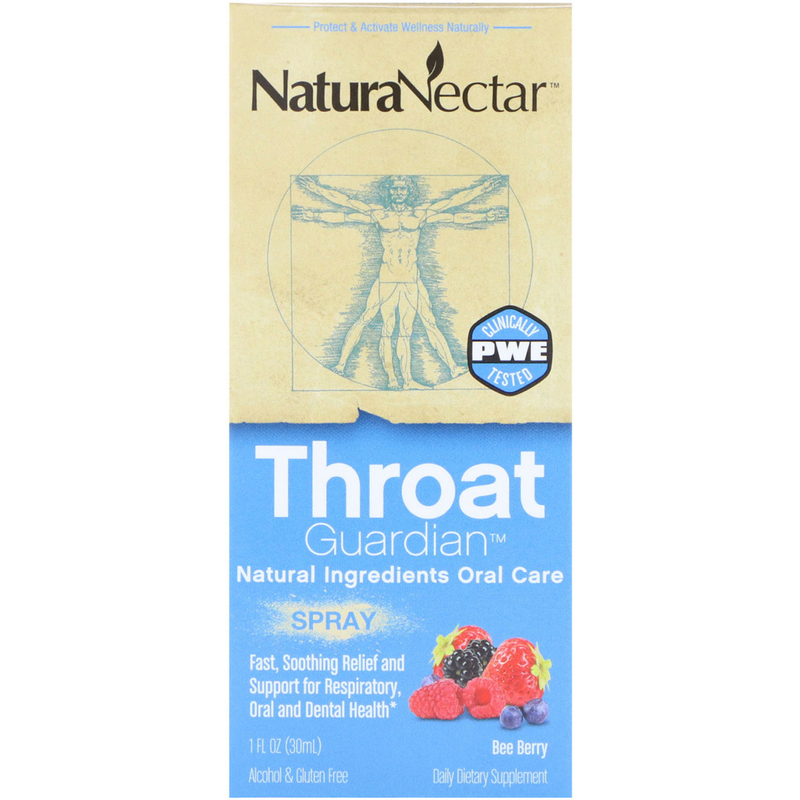 NaturaNectar's Throat Guardian provides natural soothing and delicious relief and supports respiratory, oral and dental health. This three-decade old Scandinavian formula from Salomon Propolis provides you and your family all the protection of bee propolis that respects your delicate mucous membrane because our formula contains no alcohol or propylene glycol, so you can Protect and Activate Wellness, Naturally. A double blind, placebo controlled clinical study, published in 2003, demonstrated that our PWE is beneficial to respiratory health, oral health and dental health. Product for the Whole Family - Children 2 years and older. Shake well before use. Apply three pumps two to four times a day into the throat and swallow. 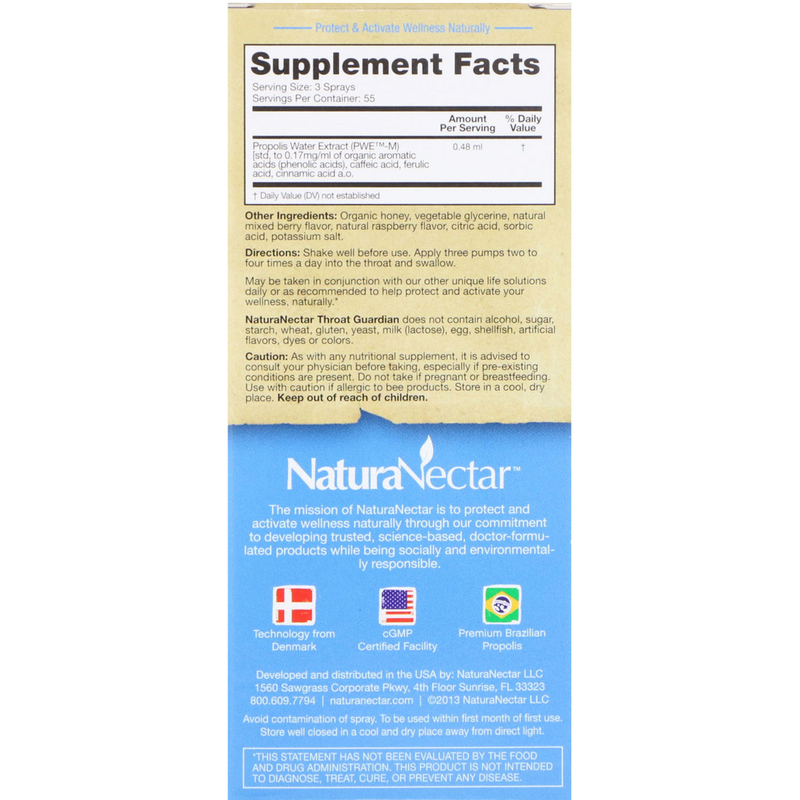 May be taken in conjunction with our other unique life solutions daily or as recommended to help protect and activate your wellness, naturally. Organic honey, vegetable glycerine, natural mixed berry flavor, natural raspberry flavor, citric acid, sorbic acid, potassium salt. 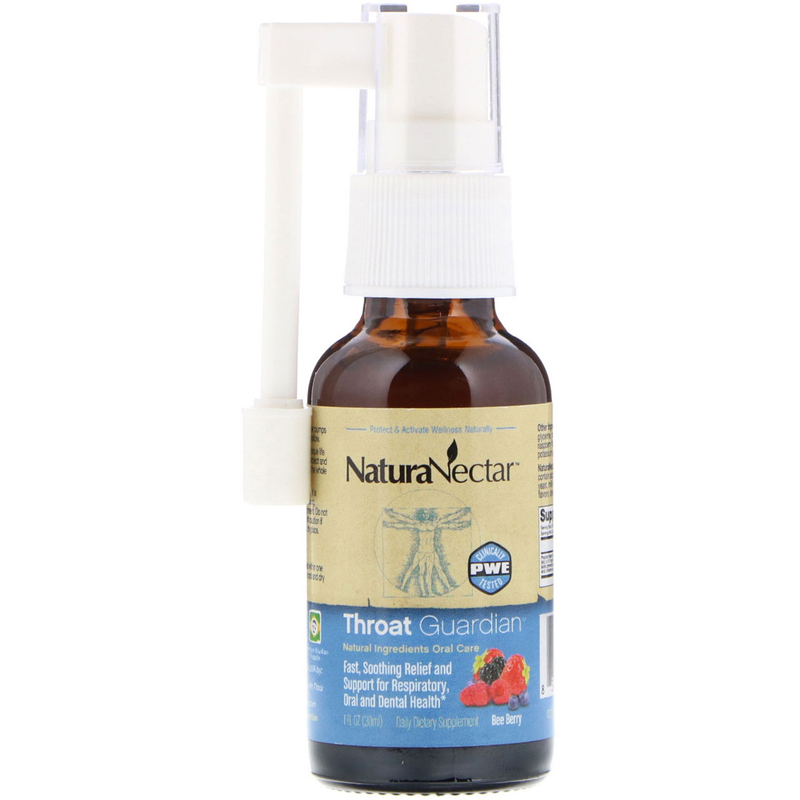 NaturaNectar Throat Guardian does not contain alcohol, sugar, starch, wheat, gluten, yeast, milk (lactose), egg, shellfish, artificial flavors, dyes or colors. Caution: As with any nutritional supplement. It is advised to consult your physician before taking, especially if pre-existing conditions are present. Do not take if pregnant or breastfeeding. Use with caution if allergic to bee products. Store in a cool, dry place. Keep out of reach of children. Avoid contamination of spray. To be used within first month of first use. Store well closed in a cool and dry place from direct light.